Palestinians stormed a gate at the Rafah border crossing on Saturday officials told CNN (file photo). Jerusalem (CNN) -- Palestinians traveling to Egypt stormed a gate at the border crossing on Saturday after waiting for hours in buses, Gaza officials told CNN. It is the first kink in cross-border travel after Egypt reopened the crossing with Gaza last week, a symbolic move that signaled the Cairo government's greater support of Palestinian aspirations. The Rafah Crossing had been subject to frequent closures by Egypt after the Islamic militant group Hamas took control of Gaza in 2007. The closure of the border had been part of an embargo policy by Egypt and Israel aimed at cutting off Hamas, but the embargo created an economic hardship on the Palestinian territory by limiting shipments of goods in and out of the country. Saturday's incident occurred when a few busloads of Palestinians arrived at the main crossing but couldn't get through. Egyptians were doing maintenance on the vehicle crossing from Gaza into Egypt and had to close it down for the repairs. But Egyptians didn't inform Gaza officials about the work. Some of the passengers on the four buses at the gate became agitated after waiting for hours, got out of their buses, and forcibly pushed the gate until they broke the chain on it and went across the border. There were no injuries in the incident and tempers cooled down. 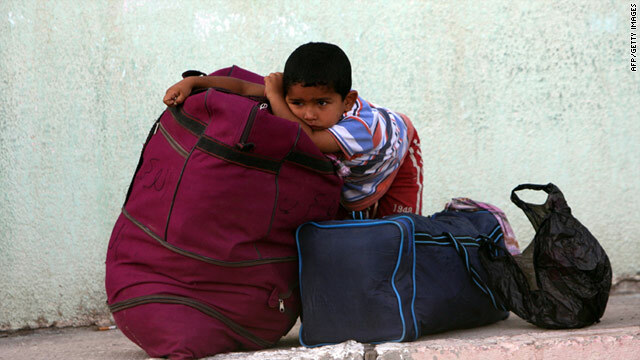 Egypt escorted the passengers back to the Gaza side and the buses went back to their destinations in Gaza. The traffic crossing from Gaza to Egypt is expected to be reopened by Sunday. The border is open to pedestrian crossings and traffic is permitted from Egypt to Gaza.